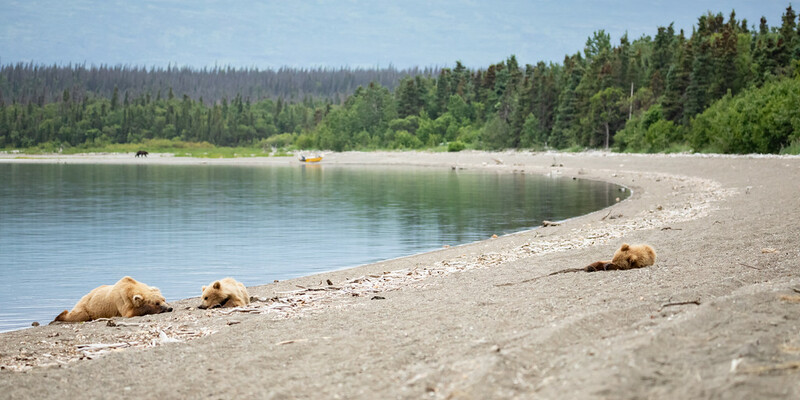 Arriving to the lake shore of Brooks Camp, there was already a bear sighted on the beach. The first of many. 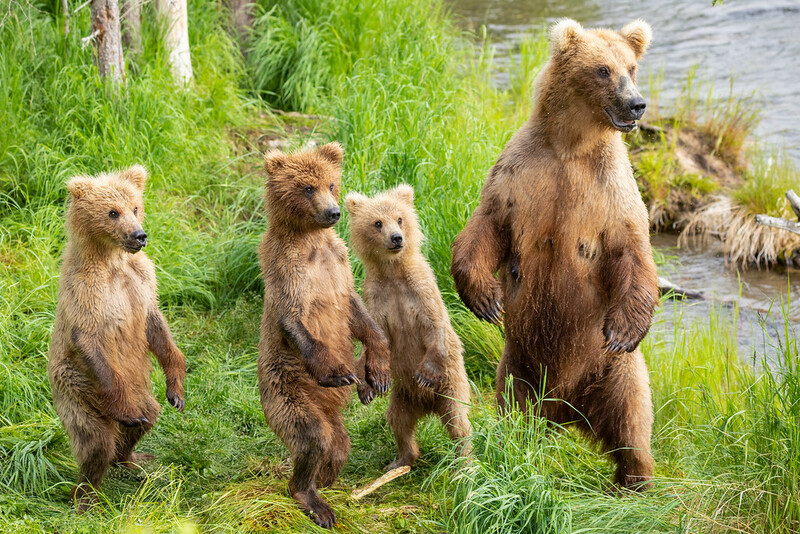 But before any bear viewing, the mandatory bear safety meeting must be attended. They are very serious about keeping food away from the bears. 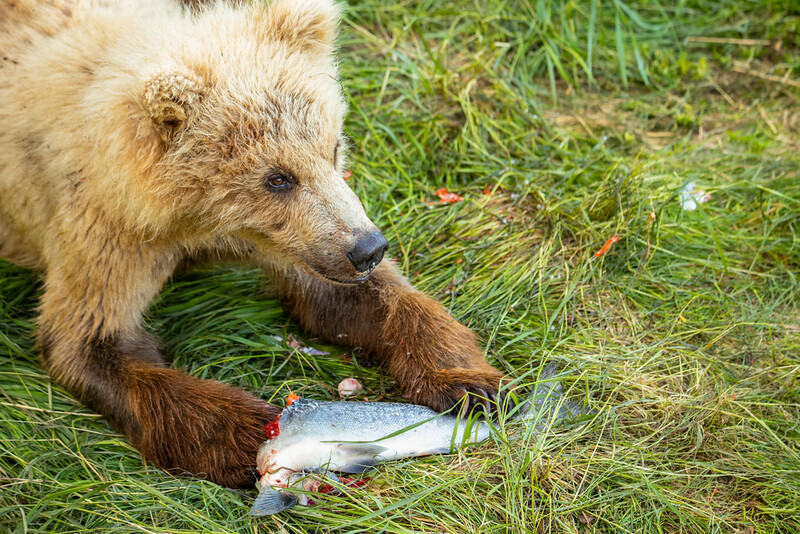 To drive the point home, they hung the pelt of the last bear that had to be destroyed due to access to human food. 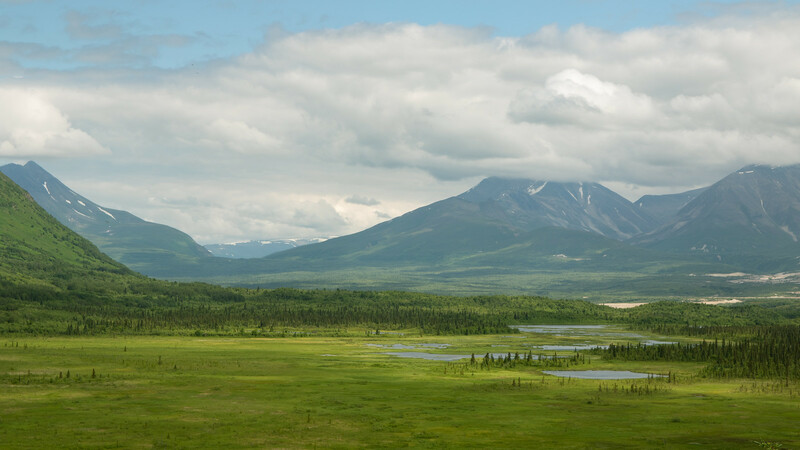 It’s a sad story, but since then an accomplishment to not have to destroy a bear in Brooks Camp since 1983. After the ranger talk, it’s time to head to camp to see where home will be for the next few days. The campsite is bordered by an electric fence that I’m told is “bear resistant”. After camp is deployed, it’s back towards Brooks Lodge and onward to the falls. Since the rules are pretty strict about carting food around, the 1.2mi walk will be done several times a day since everyone has to come back to camp for food. 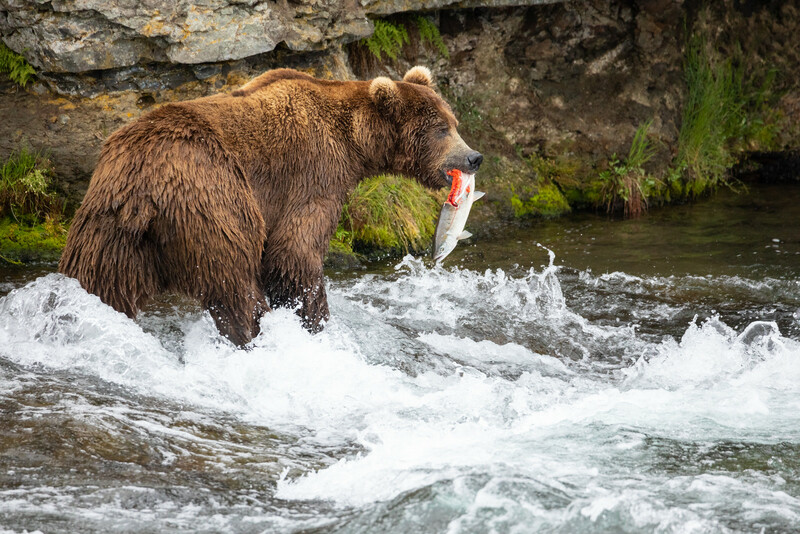 The salmon haven’t showed up in large numbers just yet, but there were bears out fishing. There was quite a few males around, plus one female that was in…heat? (not sure what it’s referred to for bears). 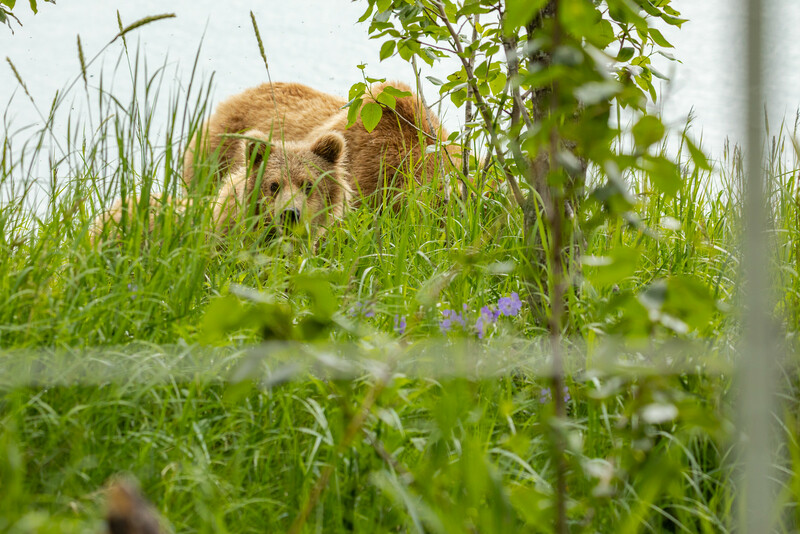 In any case, this female bear was courted by several bears throughout the afternoon. And they weren’t modest about it either. With all the romantic endeavors going on, they also found the time to catch a fish or two. And that’s how the rest of the afternoon/evening went – fish, eat, mate, and repeat. 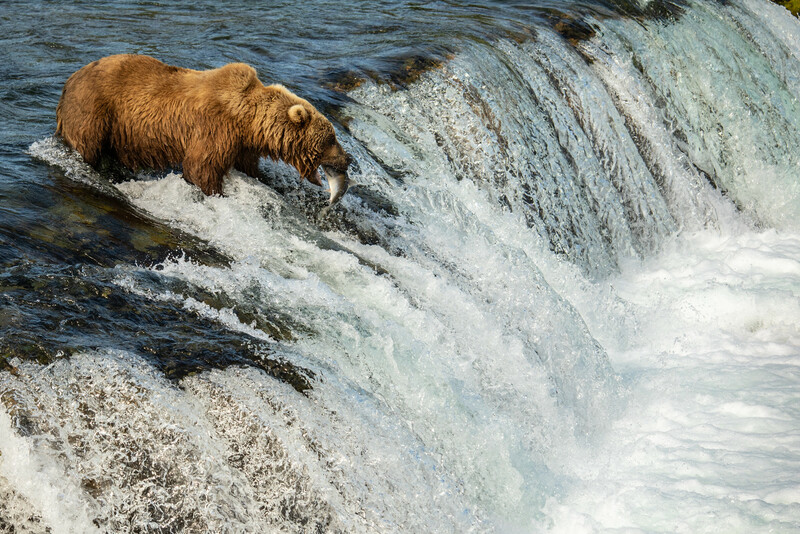 One of the photos that I have to have on this trip is a bear fishing the lip of the falls. There was a female that tried this evening, but we’ll have to see if I can get a better one in the next couple days. Getting late, it’s time to start heading back to camp. Heading to/from the campground yielded some of my favorite moments. It’s now 11pm, and I’m ready for some sleep. 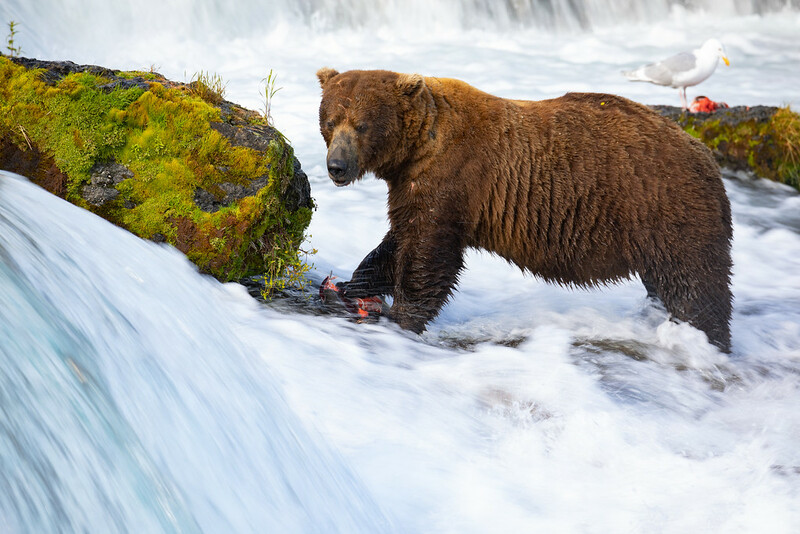 But there is always a bear out to photograph, and the light hangs around super late. It makes for some quiet and peaceful times. Oh well, I’ll sleep when I get home. 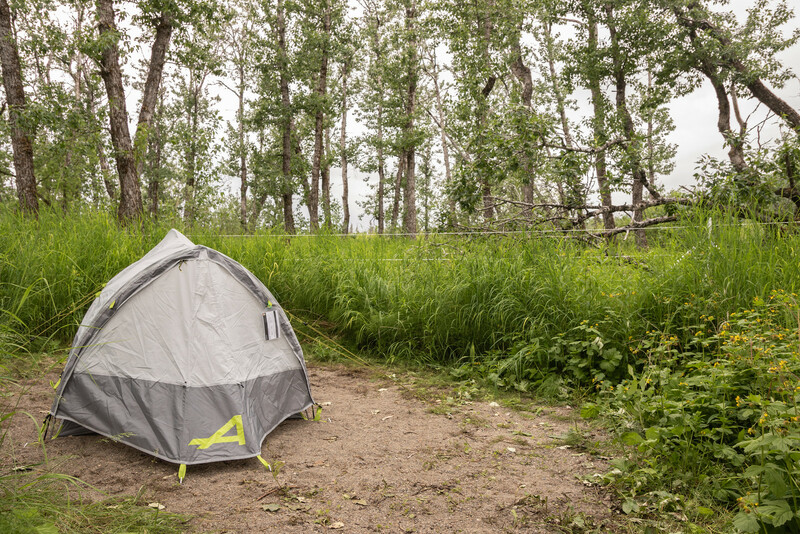 The trail between the campground and the lodge area parallels the beach, and bears sleep out on the beach at night. So, there is a bit of caution necessary before walking that trail. Since the trail is a few feet into the trees with low visibility, I found it to be a good idea to take a peak along the lake shore before walking the trail. Not to see if there are bears present, but where. Remember that yellow boat way off in the distance in last night’s photo? That is about where the visitor center is with me standing outside the campground. 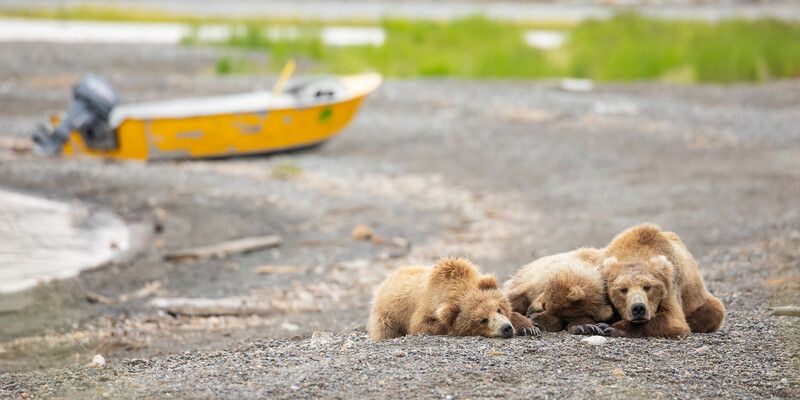 During the night the bear family moseyed closer to the visitor center (yellow boat for reference). 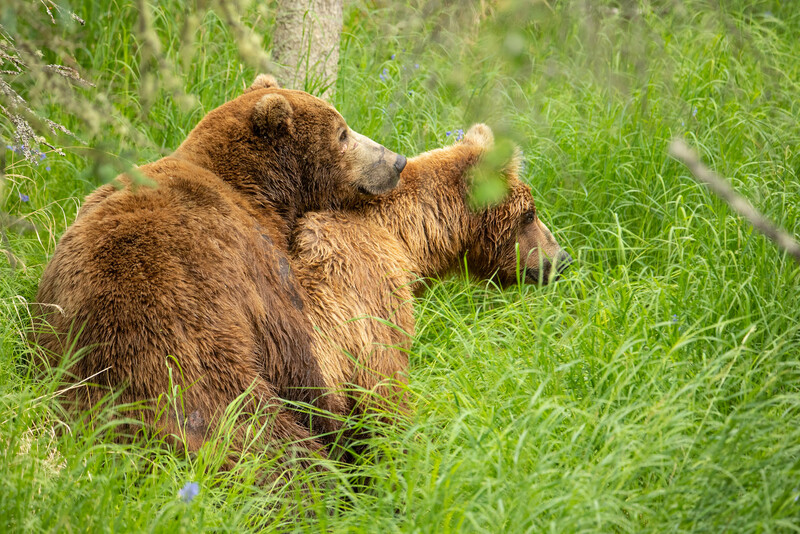 In addition to this bear family there was another sow family closer to the bridge. I hung around them for a few minutes before heading over to the falls. At the “ripples” platform, there was a sow/three cub family hanging around that I’ve recognized on and off throughout the trip. One of the cubs is notably scrawny, looking almost unhealthy. As soon as Mom goes out to fish, it’s pretty evident as to why. 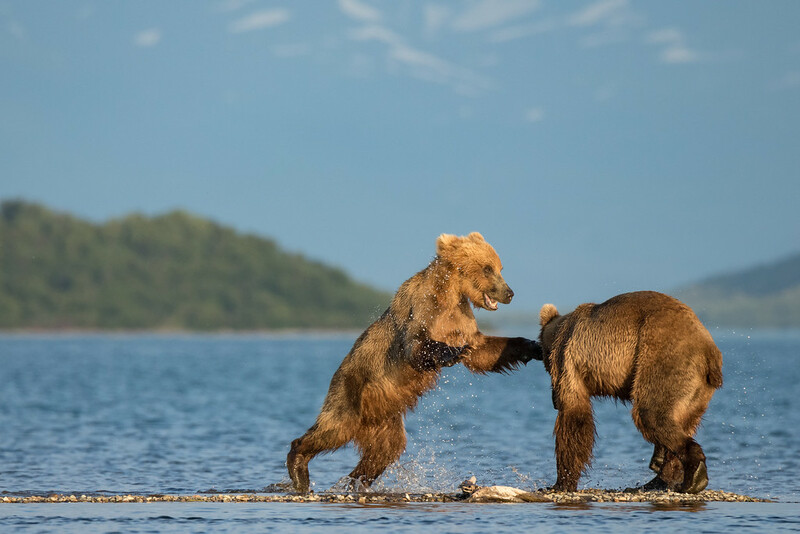 When a fish is caught, the two larger cubs swoop in to eat, and they are quite aggressive about it with plenty of fighting and audible growling. The snarling is so intense, they sound like adult bears. 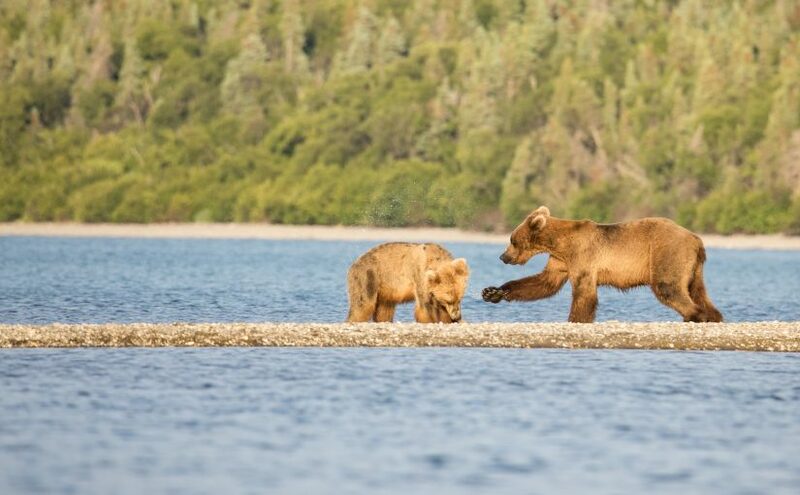 During this feeding frenzy, the smaller cub would just stand at a distance and watch. Could be reading too much into it, but I didn’t see the little cub eat anything all morning. 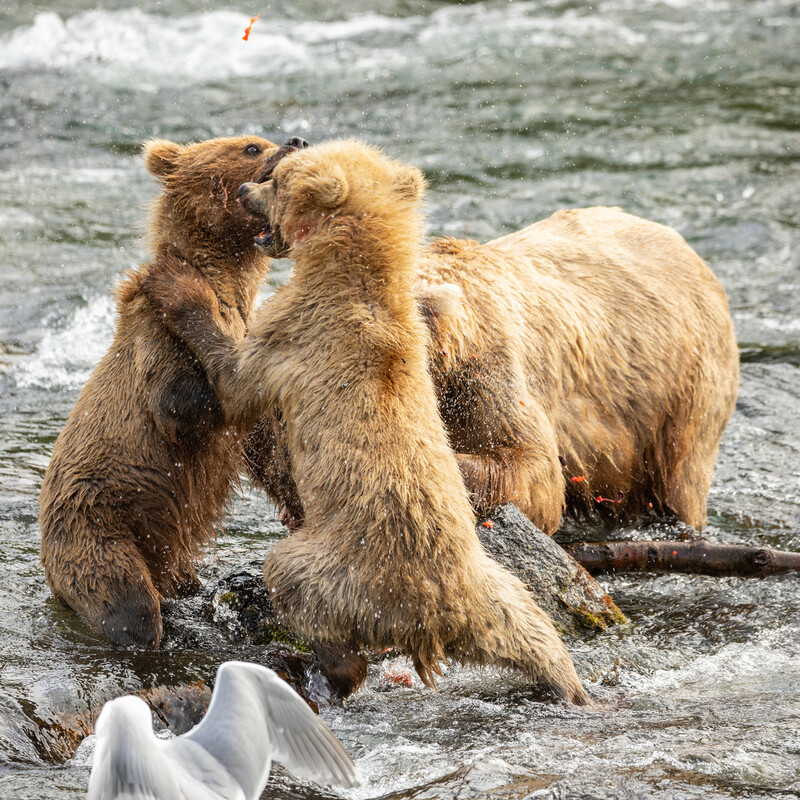 Mother bear would catch a fish, and the two bigger cubs would battle for their portion. As the morning went on, I noticed another problem…I was running out of card space. Also the lack of breakfast was starting create some raging hunger of my own. I headed back to the campground for my laptop and then back towards the lodge for some lunch and photo transferring. But first there was a bit of an obstruction in front of the gate. A group of other campers and myself decided to make an escape out the rear gate. 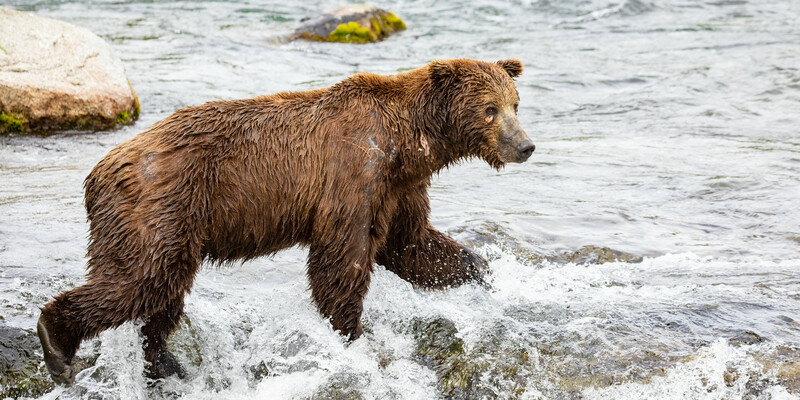 As if the bears saw us making a break for it, they followed us down the trail for a bit, but then veered off. If you follow any of my Yellowstone adventures, you know that mid-days are either used for naps or a day hike. Usually it’s good practice to put the camera down during the harsh midday sun and do something else. But today I just couldn’t do that – still can’t get over the fact that there are bears everywhere! 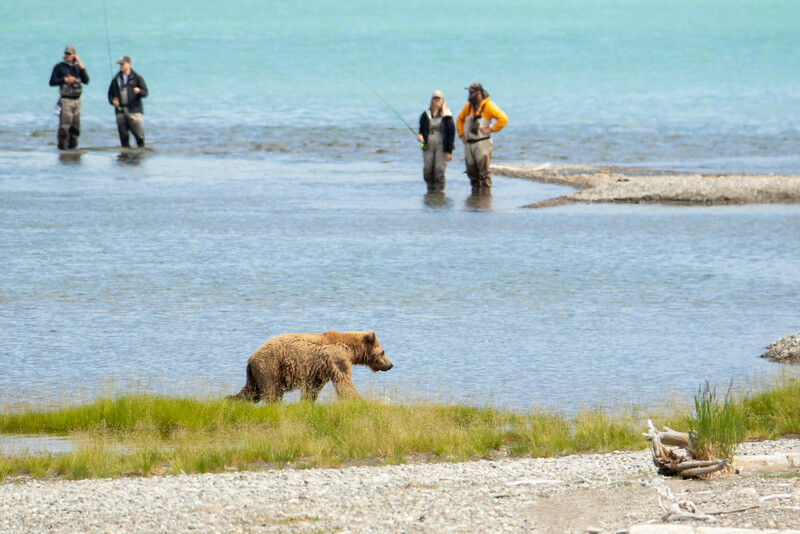 After lunch I remained at the lower river platform observing bears (and people) try to snag a fish. Concerning photos, the strong overhead sun causes two issues: heat waves and top-lighted subjects. If shooting on or over land, the heat wave distortion can sometimes be…unbearable (sorry). But sticking to the lower river platform, which is right on the riverbank, lessens that problem as long as the distance between me and the subject is over the cool water and not over land. Which just leaves the lighting issue. As I was practicing some action shots at eye level, the midday sun is pretty obnoxious, casting an unpleasant shadow on the bear’s face and chest. So while it’s good to practice capturing the action, most of these shots will not be as good as something in early morning / late evening. Much of the time was spent just watching, and that’s OK. Because they are just comical when fishing. And every once in a while, they might position in such a way to make the direct overhead lighting more tolerable. By late afternoon, it was time to head to the falls. 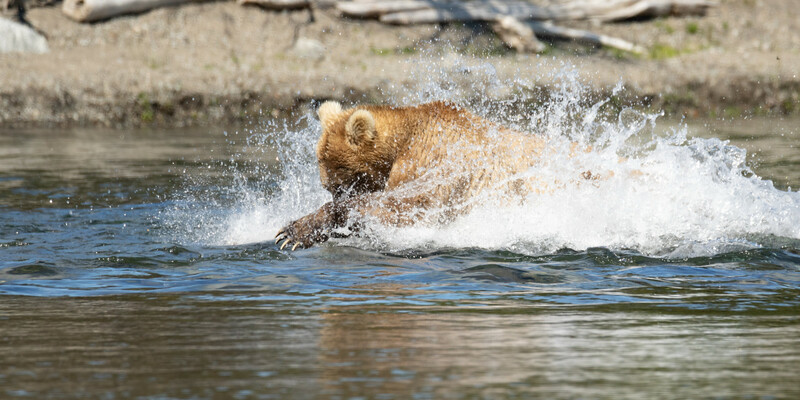 The salmon activity really picked up, with many jumping the falls at once. The buildup of fish before the falls was so dense, it looked like a fishery pond or something. 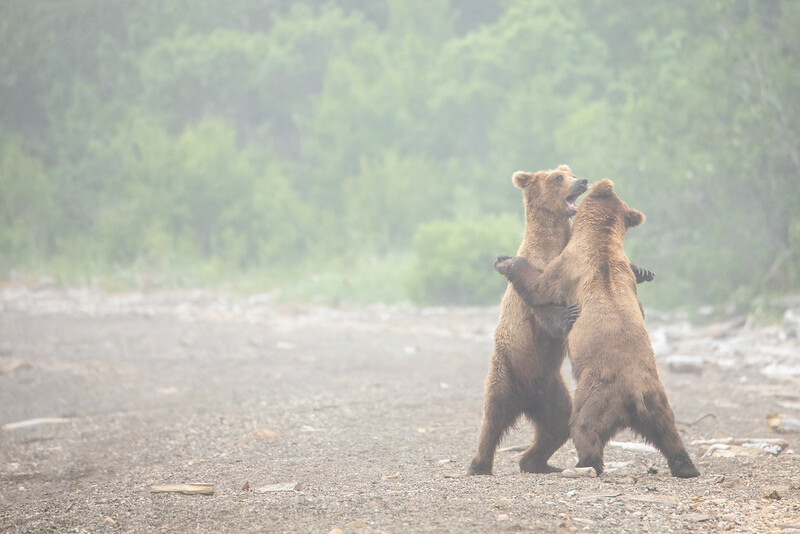 There were a couple male bears present in the early evening, but they shortly left. With no large males around, the sow with three cubs every so cautiously showed up. 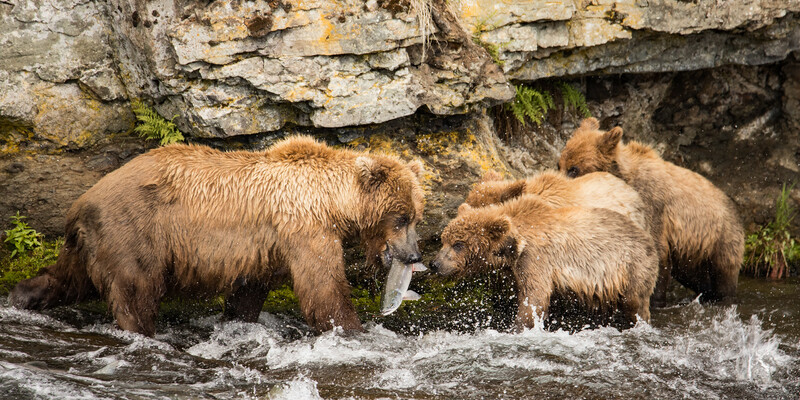 With the abundant fish, there was plenty to go around…even for the smaller cub that didn’t get any earlier. 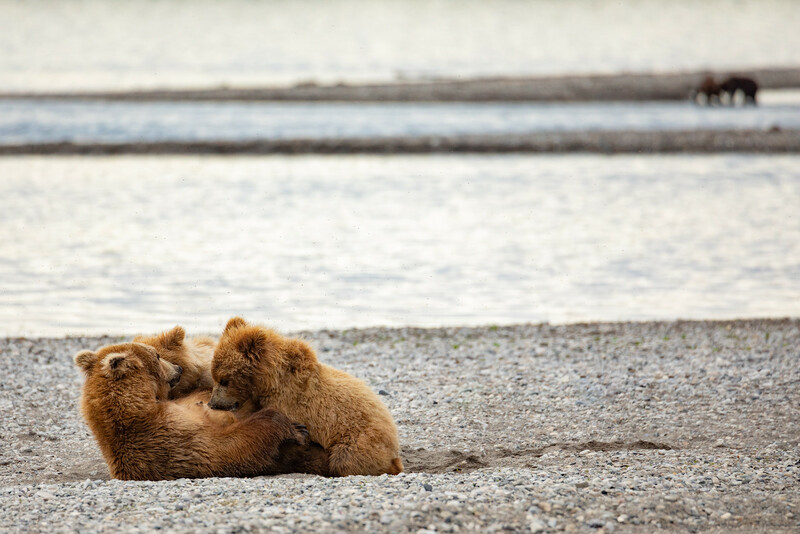 This bear family ate right below the viewing platform, so it was hard to leave. But it was getting late, so I was back to camp after 10pm. On the way there was something trotting along the shoreline. Assuming it was a cub, I pointed the lens at it looking for the mother. 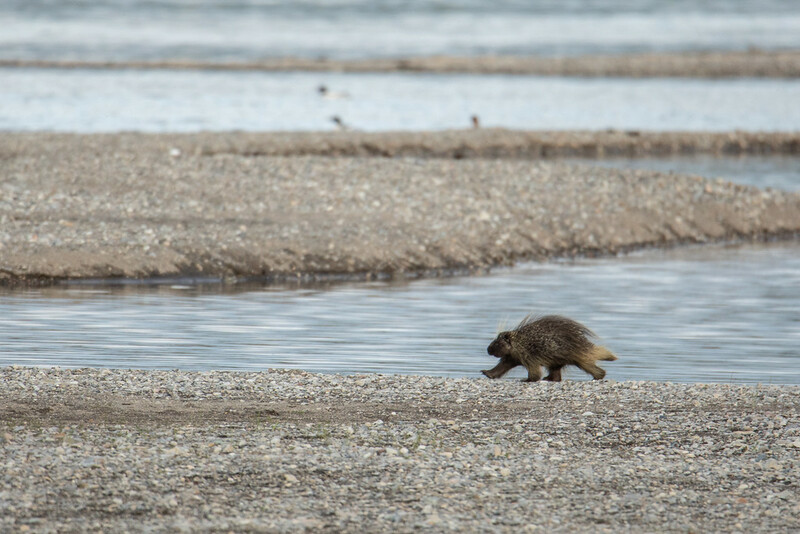 Wait a second, is that…a porcupine? Add that to the list of misc wildlife sightings. Up at 7am, checking on the beach before making a break for the visitor center area. There were a couple sparing sub adults, so enjoyed them for a bit before they moved on. It was a foggy morning that delayed the day-trippers from arriving. It was a peaceful time absent from the sound of arriving planes until later that morning. Today’s agenda is the Valley of 10,000 Smokes tour. So it was time for a full breakfast and then hanging out at the lower river platform. The fog was significant, but cleared up as we left the Brooks Camp area. Either it wasn’t as foggy away from the lake, or it cleared as the day warmed up. There is a small visitor center overlooking the valley, and the group hiked down to river-level for a closer look. 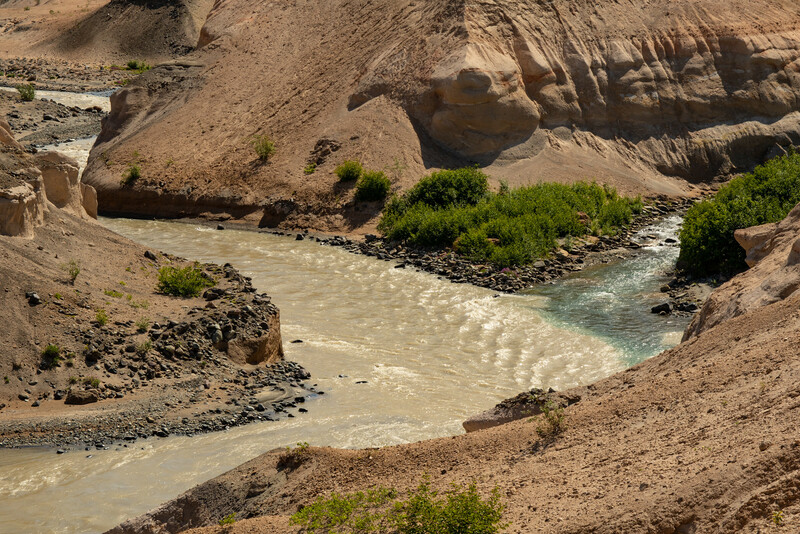 The trail offers close-up views of the river that cuts through the ash fallout and a view of the confluence of a glacial-fed and snow-melt sources. The difference is notable because the two rivers are a noticeably different color. On the way back to Brooks Camp the mountain view was much clearer. 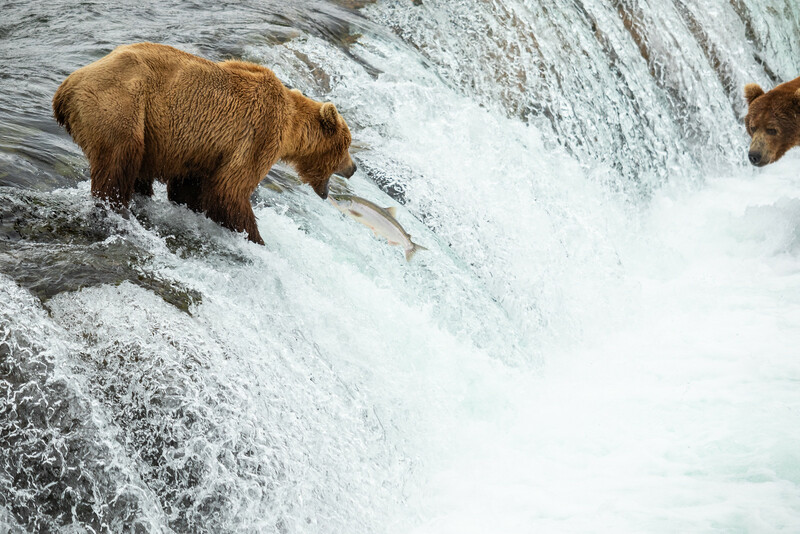 The bus goes all the way back to the lower river platform, but I opted to be dropped off at the falls and jump right back in to bear photos. No large males present again, and there was a sow/cubs and additional sub-adult taking advantage of that. As the afternoon faded into evening, more bears cycled through. The falls-fishing female showed up again and attempted to fish the lip of the falls. A couple memory cards will filled as she attempted to catch fish. Here is the best one from the evening. While heading back to camp, there was the all-time favorite moment of the trip. The sun was setting behind me, and the same two sub-adults were sparing out on the sandbar at the mouth of Brooks River. 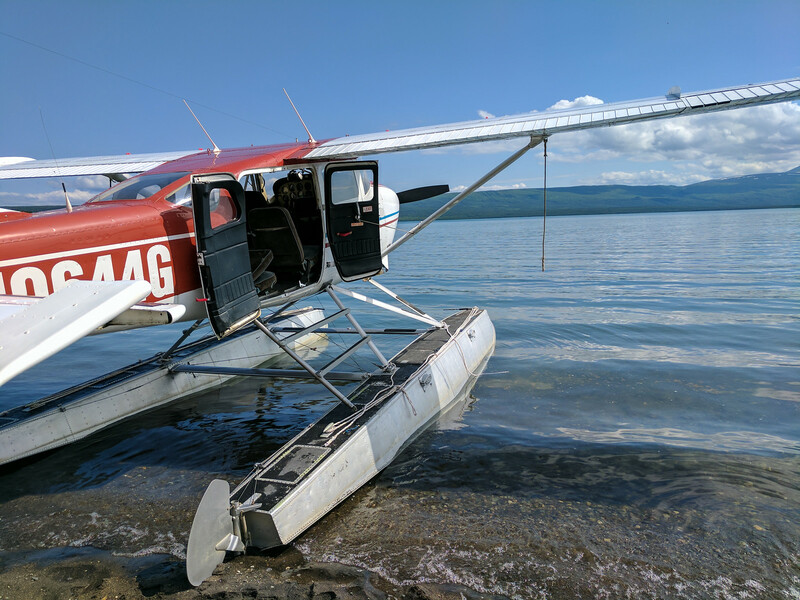 It’s a time in the day where all the day-trippers and float planes are gone. 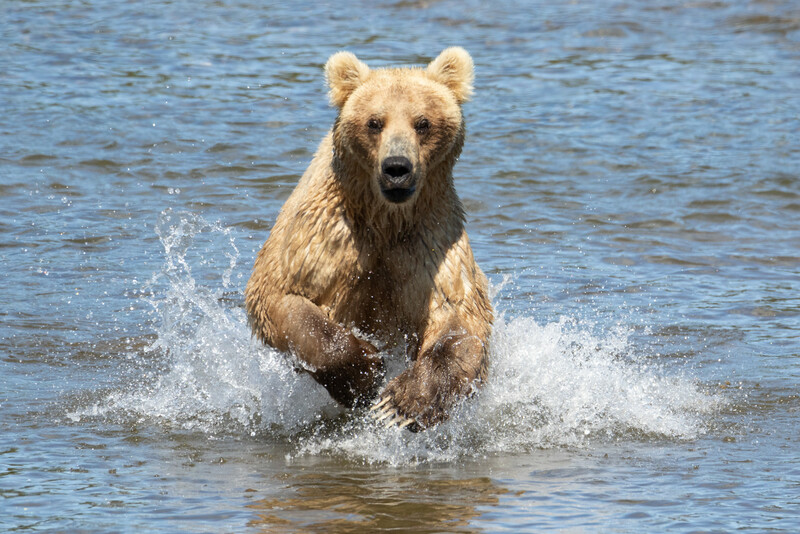 We are left with total silence except for nature sounds all around – including the patters of their paws as they hit the sand and sounds of splashing water as one of the bears mischievously splashed the other. The bears stayed out past sunset, and myself and a few other photographers stuck around then got back to camp around midnight. The day started and ended with the same two sub adults playing on the beach. Sadly, this is the morning to break down camp. My flight out is scheduled at 1pm, but I still felt uneasy about crossing the bridge. Mainly because it’s the uncertainty of getting back. When bears are in the area, the bridge might be open for seconds at a time between hour+ closures. 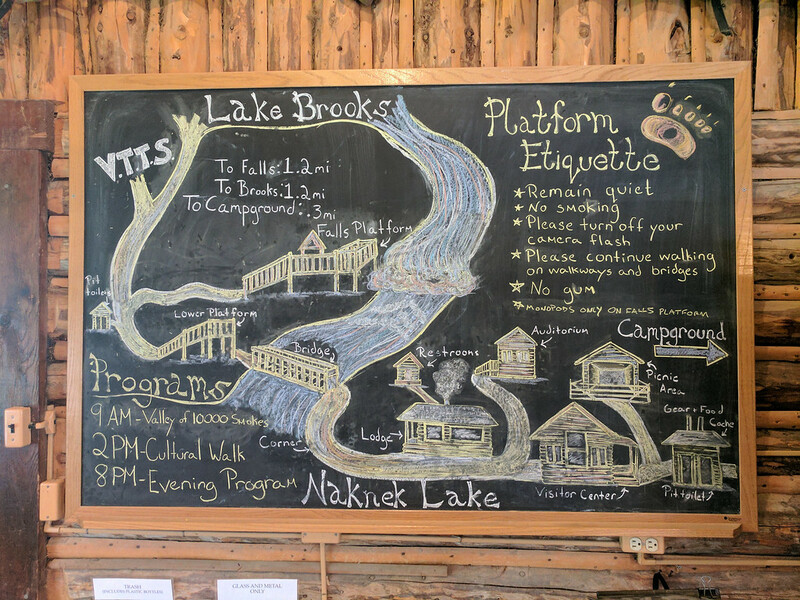 Instead of worrying about when to return, I just stayed on Brooks Camp side of the river. Not that there wasn’t anything to see on that side. The bear family that’s been around the beach the last few days were nursing this morning. There were also plenty of moments of fishing near the lower river platform. At this point, exhaustion was starting to take over. I spent the last couple hours in the lodge backing up memory cards and drinking coffee. And then finally, all good things must come to and end – it was time to begin the multi-day journey back home.